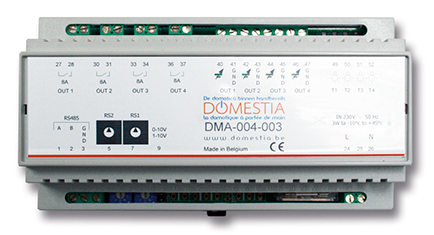 The “DMC-004-003” is a 4 dimmer output extension module (4 x 0/1 - 10V): it is connected to our Starter Kit or to our management unit via communication bus RS485. It can also be autonomous and managed directly via a push-button in stand alone mode. It has 4 analogue outputs 0/1 - 10V for controlling the voltage of dimmable electronic ballasts (e.g. TL tubes, etc). In addition, it includes 4 16A unipolar potential-free contacts for the electrical control of the latter. Number of outlets available: 4 outlets at 0/1 – 10V and 4 potential-free contacts.